Nails Of The Week 23: Christmas Nails! 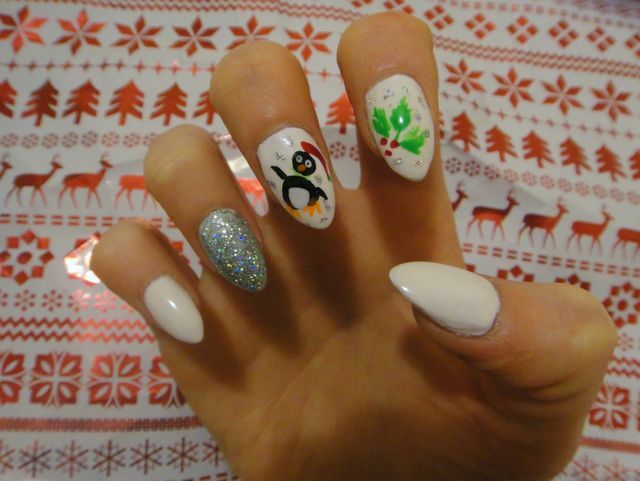 Nail salons usually have boards of super tacky acrylic designs, but when I spotted a set of Christmas themed designs on offer for £1 each, I had to have the cutest penguins! White nails are all I fancy at the moment and these had me set through Christmas with a little fun. Hi all! I hope you all had a wonderful Christmas! Mine was very different to the norm but it's so lovely to be at home even for a little while, and despite travel complications because of the flooding, I manged to see all the special people I wanted to! I have been a bit under the weather but purposely have tried to do very little and want to ring in the new year in perfect style. Here are a few snaps from a few weeks ago! I lusted and I avoided but I have a very big soft spot of Wildfox. I have the classic logo tee and had the ouija board dress once, but nowadays the prices are way out of my reach. I've seen a few really cheap knockoffs of the Seeing Stars Lennon sweater but I saw this jumper in Topshop and the rest is history. 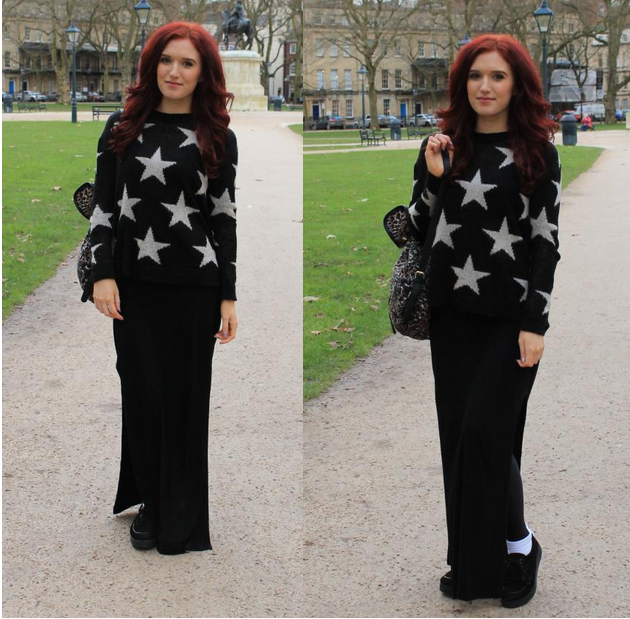 I have a few black maxi dresses now and always layer them for work on a casual day. 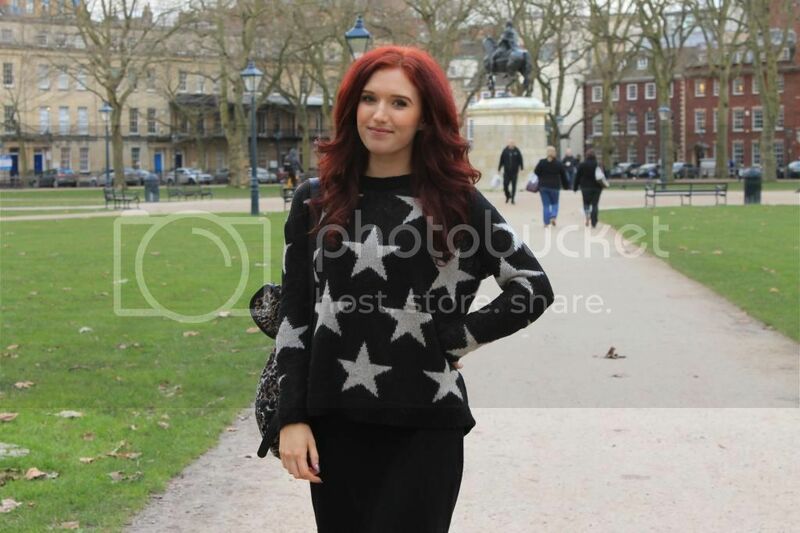 These photos were taken near work with Motel girls Lucia and Sophie! As daylight is so short, we all have trouble taking good photos so we came together in all our blogging glory. You have to check out their blogs, these are two of the best girlies! The Wildfox Fall 2011 collection lookbook is the best one ever in my opinion - I LOVE '70s flares and the curls and the platforms. I'm tempted to cut up my jumper into laddered holes when I've had my wear out of it, and wear it with my denim high waist flares and a floral headband. Outfit Of The Night: Christmas Velvet! Roll up, roll up, the Motel Sale has officially launched and there are literally hundreds of items! I would know, because I was one of the people changing these hundreds of prices myself! After my eyes fell out a few times, I had a gander and here are my top picks that you will not want to miss. I have the lucky opportunity to try on most Motel things so I know what is definitely worth your spends! Also you can order right up until Friday to receive items by Christmas, and our warehouse is pretty damn hot so no worries! The one item you need to get your mitts on FAST is the Delorious Dress in Green - not only is it off shoulder (SWOON) but it's the amazing green iridescent sequins that make it gorgeous for photos! I kept seeing so many beautiful Instagram snaps of it on the #motelrocks feed that I made a Facebook album of them on the Motel page - it's literally a camera's dream dress. It doesn't have high stock so should be sold out by the end of this week, don't delay! Also I was very tempted by the Tatun sequin bralettes this season as I have an infinite amount of skater skirts. I'm still tempted now as I have planned all my Christmas outfits and wouldn't mind something extra festive for day to day. I have two roll neck crop tops now but I am eyeing up a Zabby roll neck dress, especially in the Mirrored Island Print which would be gorgeous with red hair. And I did try on this Stardust Playsuit and looked like a baby in a babygro, but I've seen it worn in a larger size and it looks adorable with a belt. Playsuits sell so well on Motel and I had an epiphany on holiday when I went out in shorts, as you are so much more free to dance! Not free with nature, but just free to dance without being cautious of the hemline of your dress, which in my case is usually short haha. The Zandra Playsuit is another one that will sell out soon, and a high neckline really shows off your hair. I bought the office sample of the Kimberley Dress as again the colour is great with red hair, and the inky black lace is gorgeous with a matte red lip. I also got the sample of the silver Porcha Playsuit to add to my sister's Christmas present, shhhh! I hope she doesn't read that! And I wore the Tera Tutu Dress to the Motel Christmas Party and loved it! You feel like a fairy! Definitely a bargain. I sort of wish I could join in and shop the sale but I've already seen these items a million times, bring on SS13! I've bought a few more Motel things for my Christmas outfits and also a few ASOS things, where I haven't shopped from in ages! I'll show you them soon, ahhh only a few more days and it's the holidaysss! I was so pleasantly surprised when I bought this polish as it looks like a green glitter! Topshop do a rainbow range of glitters but Ashes and Fire is actually holographic instead of the festive green that it looks on the shelf. I put on three coats and it became a glitter bomb of constant sparkles; the perfect Christmas polish! 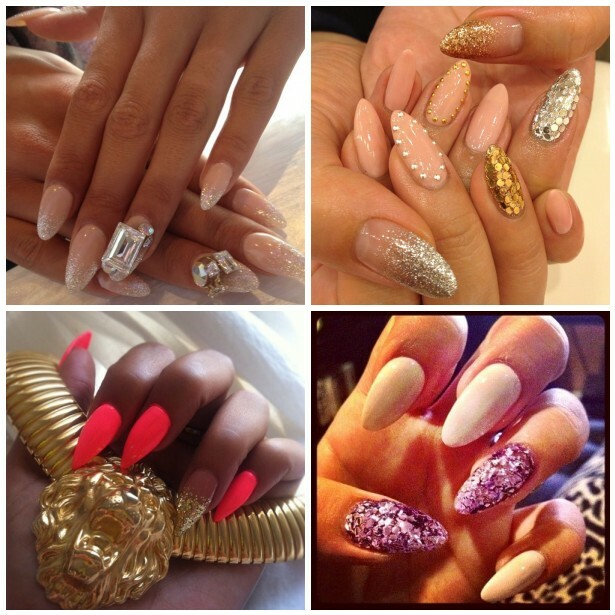 I had my nails filed into points last time I hit the salon and loved it! They felt really spiky but they seemed to get more rounded after a few days so they weren't as effective. I might get my nails redone before it is party time this weekend onwards, and might go back to square for the moment. 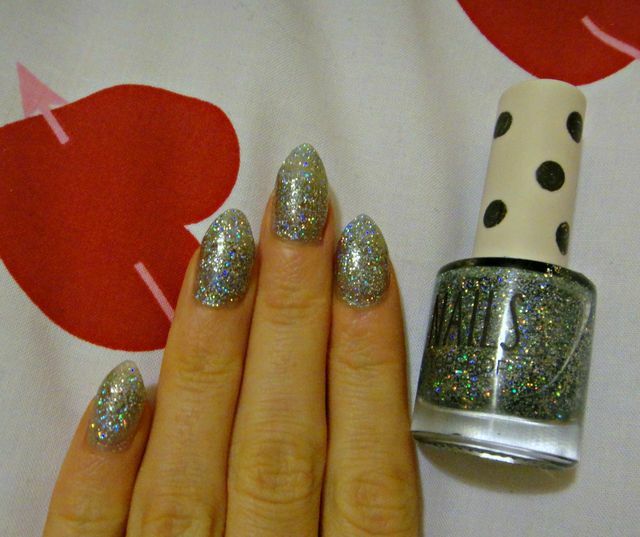 I can't stop reblogging pointy nails on Tumblr though! I'm absolutely cream crackered (knackered yah!) this week - the run up to Christmas is getting faster! I've surprising done 90% of my shopping and can't wait to wrap it all calmly. I am a terrible wrapper so it will take some time and effort! I'm having trouble with guy gifts though so I'm getting my paws on any sort of gift guide. 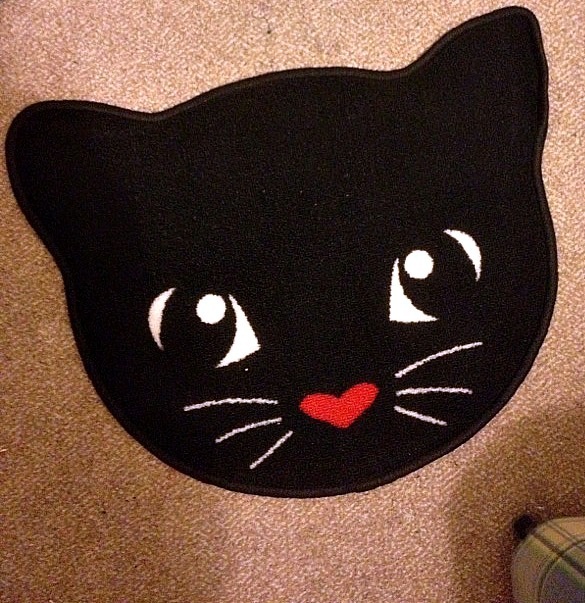 Speaking of paws, I just had to show you my new H&M rug! I left a little corner of my bed in the snap so I could show you how big it is, and it was a grand total of £3.99! Amazing! It's probably made for a kid's room but I love it, it's so cheery. Sadly you all love it too but it seems to be sold out on H&M online, boo! Their delivery takes a while but they are a decent website to use and have am amazing host of reasonably-priced homewear. Wipe away your tears as I've pulled together a selection of other gorgeous pieces, including a cupcake rug/bath mat and a classic heart print bedspread. Along with the kitty rug, I ordered the heart double bed set of the bedding too but that sadly also seems to be sold out now. Alas now we know, order from H&M quickly if you see something you like! Also they don't list their sale items in normal categories, so don't forget to check the sale tab for extra items! 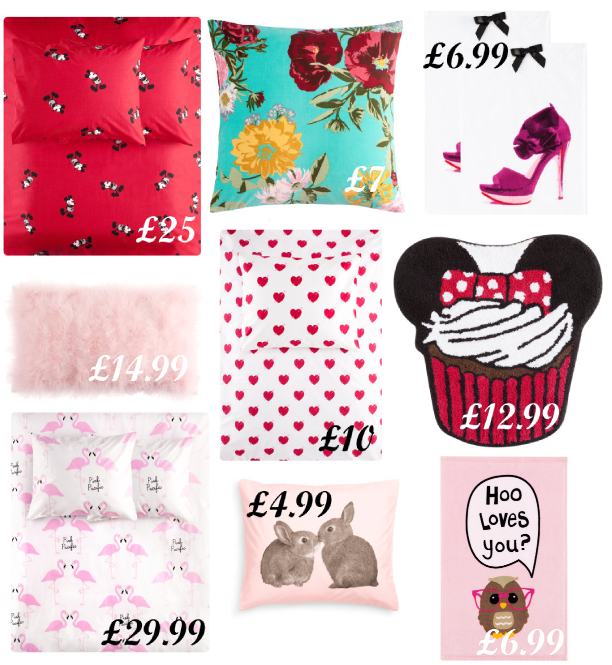 Mickey Mouse double duvet set, Velvet floral cushion cover, Shoe guest towels, Flamingo double duvet set, Feather cushion cover, Hearts single duvet set, Minnie Mouse bath mat, Rabbit cushion cover, Owl guest towels. I've had a week that seemed to never end, with the Motel staff party on Wednesday (woah - there are stories never to be shared!) and a fab night out on Friday with dancing to the best (not the cheesiest) of the '90s. I've been casually Christmas shopping but honestly nothing has taken my own fancy, despite wanting some heels. On Thursday ASOS were offering free next day shipping - and let's face it, almost every retailer will be offering it in the coming week - and I nabbed a dress I was thinking about all day. I've shifted my style recently so that when I go out at night, it is a chance to wear a few trends to the max, as I often buy cool accessories and lipsticks and headbands but don't get to do them justice when I'm doing my daily rush. Before I was strictly bodycon at night, but now I'm so happy to wear flats, socks, skater skirts or shorts, and just have a good old dance. It's probably because Bristol isn't all about the glamour and also I don't like putting tonnes of pressure on a night now. I've always been one to care about my hair and makeup a bit more too. However I was wanting a fresh injection in my wardrobe and this ASOS dress caught my eye because a) I love a good waist cut out, b) the double straps were mighty cute, and c) it has a gorgeous skater skirt that is made of twirling and dancing around in. I was concerned that it is classed in the petite range but as you can see, it's not short on me, so I reckon it would be knee length on a petite girl. It should be a bit tighter but I got an 8, and it is quite loose on the waist, so I would just get your normal size! They have it in red which would be absolutely lovely for Christmas, but would totally clash with my hair, so black was my choice! I know I can wear this at night and then it can transfer to daytime too with tights, so it should fare me well! I added creepers and socks for a '90s nod too. Girl Power! Oh hellllloooo shoes of dreams! 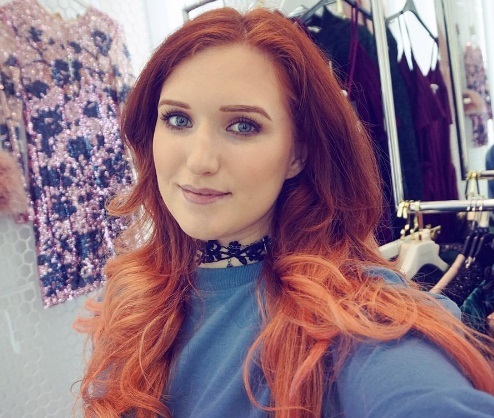 I went shopping with my housemates on Sunday but we only made it around a few shops as we had a major spree in New Look, where I scoped out the shoes I had in my last glam wishlist post. These glitter wedges are just as pretty in real life but they are SO HIGH I did fear a broken ankle. Wouldn't it be worth it though? I've had a couple of purchases throughout my life that were whistful pretty items I knew I wouldn't wear to death, and the glamour just wears off over time. I decided to leave these shoes on the shelf for a braver shopper. They are haunting me though... I may stop by New Look again so see if they are still there!